Why are college tuition and college textbooks so expensive? This article from Investors Business Daily is very helpful. This hypothesis – that it is government subsidies that drive up tuition rates – is supported in the radically leftist New York Times, of all places. 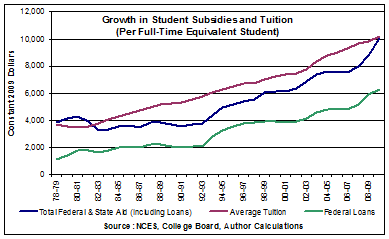 […][T]he astonishing rise in college tuition correlates closely with a huge increase in public subsidies for higher education. If over the past three decades car prices had gone up as fast as tuition, the average new car would cost more than $80,000. […]As the baby boomers reached college age, state appropriations to higher education skyrocketed, increasing more than fourfold in today’s dollars, from $11.1 billion in 1960 to $48.2 billion in 1975. By 1980, state funding for higher education had increased a mind-boggling 390 percent in real terms over the previous 20 years. This tsunami of public money did not reduce tuition: quite the contrary. But where is the money going? Is it mostly going to research? To the classroom? 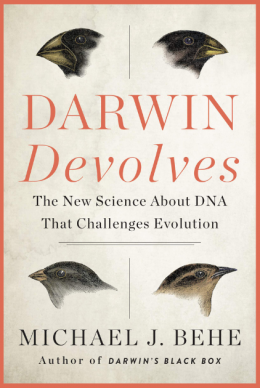 To hire more and better professors? Do you wonder why college is so liberal? It’s because instead of hiring professors to teach you how to do useful work for money, they are hiring useless administrators who just enforce politically correct secular leftism onto the students. 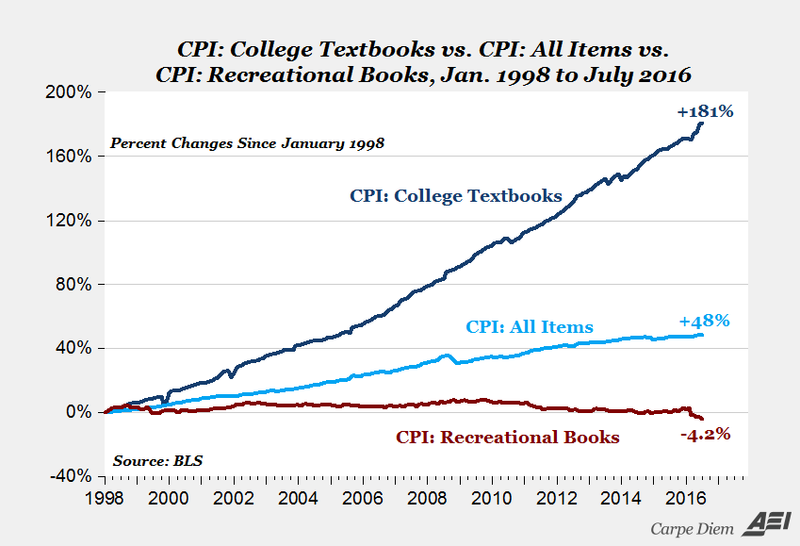 College textbook prices are also going way up because of government subsidies. One way the textbook market is insulated from competition and market forces is that the professor, not the student, makes the decision on the textbook for a course, and it’s probably the case that many professors are unaware of the retail cost of the books they assign for their students. And once the professor decides on a textbook, there are no substitutes for the new edition of the book assigned. If a professor assigns Mankiw’s Principles of Economics textbook, students can’t substitute McConnell’sPrinciples of Economics textbook. Another reason for skyrocketing textbook prices could be that they are being fueled by easy and cheap credit in the form of student loan debt, which now exceeds $1.36 trillion and has doubled in less than eight years, and tripled in the last decade! Students borrow money not just for college tuition and fees, but also to finance the purchase of textbooks that now routinely cost more than $300, and sometimes approach $400. What should young people considering college do? If you’re going to college or trade school, go to a low-cost school. Do a STEM degree (e.g. petroleum engineering) or learn to do a trade that pays well (e.g. – electrician). Try to get tuition assistance even if it means going to a less prestigious school. And work at every opportunity you get in the most serious job you can find. Don’t spend your money – save it. Especially don’t spend your money on fun, vacations and alcohol. As soon as you grow up, you’re going to wish you could have it all back. Basically, college administrators know that people are willing to pay X to go to university. This is by Paul F. Campos, law professor at the radically leftist UC Boulder. The more money that is attached to students, the more money universities charge – simple. What should young people considering college do? If you’re going to college or trade school, go to a low-cost school. Do a STEM degree or do a trade that pays well. Try to get tuition assistance even if it means going to a less prestigious school. And work at every opportunity you get in the most serious job you can find. Don’t spend your money – save it. Especially don’t spend your money on fun, vacations and alcohol. As soon as you grow up, you’re going to wish you could have it all back. Why is college so expensive? 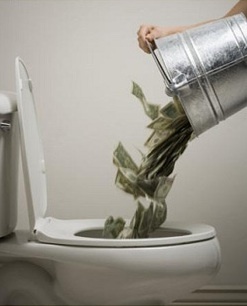 Why does university tuition cost so much? The correct answer appeared in the radically leftist New York Times, of all places. […]State appropriations reached a record inflation-adjusted high of $86.6 billion in 2009. They declined as a consequence of the Great Recession, but have since risen to $81 billion. And these totals do not include the enormous expansion of the federal Pell Grant program, which has grown, in today’s dollars, to $34.3 billion per year from $10.3 billion in 2000. If you’re going to college or trade school, go to a low-cost school. Do a STEM degree or do a trade that pays well. Try to get tuition assistance even if it means going to a less prestigious school. And work at every opportunity you get in the most serious job you can find. Don’t spend your money – save it. Especially don’t spend your money on fun, vacations and alcohol. As soon as you grow up, you’re going to wish you could have it all back. This article from the Wall Street Journal has been the #1 editorial for much of the last four days. […]”We don’t do debt here,” [School President Jerry C.] Davis says. “The kids graduate debt free and the school is debt free too.” Operating expenses are paid out of a $400 million endowment. Seeing the success of College of the Ozarks, one wonders why presidents of schools with far bigger endowments don’t use them to make their colleges more affordable. This is one of the great derelictions of duty of college trustees as they allow universities to become massive storehouses of wealth as tuitions rise year after year. He says a dozen or so students will be taking a pilgrimage to Normandy in June to commemorate the 70-year anniversary of D-Day and the former College of the Ozarks students buried there. Amazingly, four of the school’s graduates served as generals in the U.S. military during the Vietnam War. […]Nearly 90% of graduates land jobs—an impressive figure, given the economy’s slow-motion recovery. “If I were an employer, I’d take our graduates over those at most any other schools,” says Mr. Davis. “The kids at these East Coast colleges strike me as being a little spoiled. Our graduates don’t expect to come into the company as the CEO.” But they certainly join a company knowing the value of work. I am always encouraging young people to steer themselves to STEM degrees, and away from debt. If you did a STEM degree at College of the Ozarks, then you would really have a leg up on life. It’s not a good time now to follow your heart and do what you like. Now is the time to dig in and do what you have to do to pay your own way later on. It’s going to get a lot harder to have even the same standard of living as what your parents had.